The waves rose and fell as the ship traveled over rough seas. A storm was on the horizon and I wondered if I shall make it to a safe coast before hitting the tempest. I looked up at the sky as I heard a distant thunder. I took out me looking glass and stared into the infinity. I spotted something in the distance. The lookout looked down at me and smiled, "Land Ahoy, Captain." I grinned as we avoided the storm and made it to the port. "All right lads, haul in the sails and dock the ship." Traveling to Vashi is like traveling to another town. In fact, its so far that even free grub may not be a carrot large enough to lure me. Although if thats a cooked tasty carrot, then I may re-consider ha. So when I was offered an opportunity to taste at a newly opened establishment, it did put me in a fair amount of thought. Traveling through Mumbai's rains can be quite a daunting task and if one gets stuck in traffic due to the rains then it can be a self haunting decision. So like any sensible person on the planet, I left my decision on nature. If rain then no game. On the fateful day, there was no rain. Smiling, I picked up my stuff and went ahead with my trip. The fare was well worth the trip in the end. My destination was a little hard to find since its located inside a building whose main entrance says "Do not Open Door." Yet one must push that door to go in. 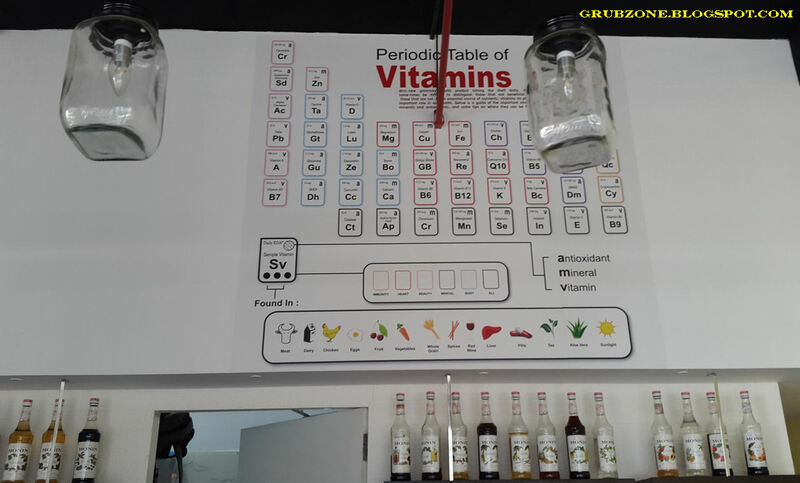 The Salad Bar & Walnut Cafe is located on the first floor of Haware Infotech Park and by that I actually mean a single building. The small cafe sits quietly near the balcony facing Hotel Sheraton. 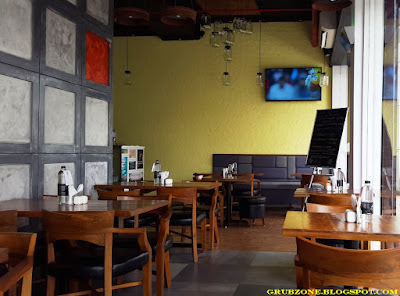 It resembles an evening pub due to its decor and such but its a cafe indeed. I would have loved to come in the evening. The lights and the colors felt like they would be more lively past sunset but I guess that is for another time. I quietly sat on a table by the large glass panes facing Hotel Sheraton and some giant beehives on a building far far away. The Salad Bar serves healthy grub while the Walnut Cafe serves continental grub. My experience was a mix of both these worlds. Its important to note that this place offers 26 different kinds of salads so its a heaven for a salad lover. Citrus Cooler was a health drink and each of its ingredients played a key role in it. 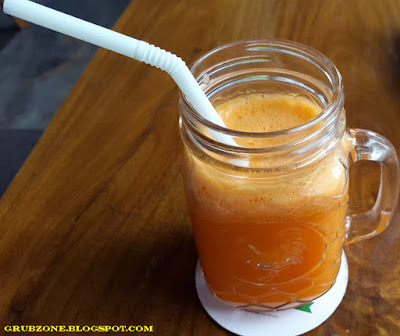 The Orange provided the color and primary flavor, the carrots added the roughage, the ginger supplied the secondary flavor and a tinge of honey for natural sweetness. Although not billed to contain pomegranate, I positively felt that there was some Pomegranate in it. Strictly for health and salad buffs. Captain : Somehow, I feel that this little muggy would have done better with some rummy. Crewmate : Well Cappy, we do need strong hands on the helm or we are doomed. Captain : One for the crew then. 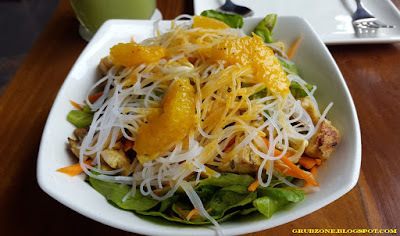 Arugula Curried Chicken Salad was a house special made of glass noodles and contained Arugula(obviously), Water Chestnuts, Curried Chicken, bean sprouts and Lettuce. It came with a Orange Carrot Vinaigrette dressing and a generous sprinkling of Orange Zest. As a vegetarian salad this item was perfect. The plating appeared appetizing and the grub was made of healthy ingredients. As a chicken salad however, I felt that it could not make the mark. The amount of chicken felt too little to make much impact on the taste. It almost felt like Irrfan Khan's screen time in Jurassic World. 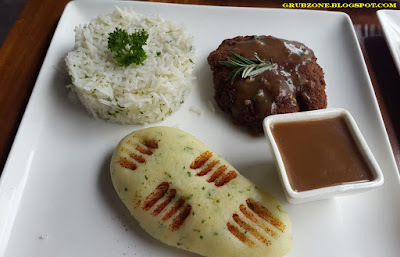 Moving towards the Walnut Cafe world, I started with a Minced Lamb Steak. The presentation was amazing. 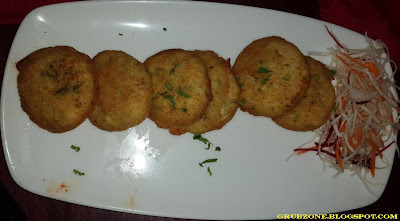 The potato mashing was very flavorsome and felt much like the potato stuffing used in Aloo Parathas. It was much better than the tasteless potato mashes served in some upscale places. The Lamb steak was made out of minced meat and served with Demi glaced sauce. Herbed Rice completed the roughage segment of the dish. The steak was very tender and full of flavor. It's taste was further enhanced by the Demi Glace which is akin to giving a buffed bodybuilder a loaded machine gun. More win on something that already wins. A bit of meat with some mashing and a spoonful of rice provided a fulfilling bite. Chicken Teriyaki is a dish with which very little can ever go wrong. 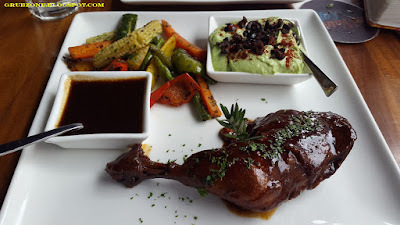 A nice tender leg of chicken completely draped in Teriyaki was served with some vegetables and a mixture of Pea puree and Humus. The Pea-Humus mixture(or Phumus henceforth) was an excellent concoction. I was initially worried that it will pale in front of the Teriyaki but it was a formidable teammate in itself. The flavors complimented each other quite well. The plating was good but just for aesthetics, a little Teriyaki art won't be bad. Captain : Tis' be just one drumstick. Now how do we share that? Captain : You can have all the greens, leave the little drumstick for me. Crewmate : Quite generous Cappy. 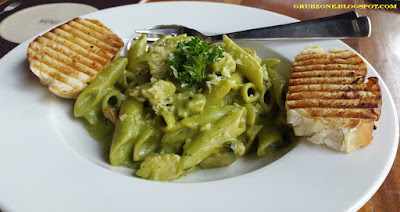 Basil Pesto Pasta was one of the best Pasta dishes that I have ever had. Toasted garlic bread topped with a portion of Pasta and chicken tastes quite heavenly. This dish pleases three senses namely smell, taste and sight. The plating may not be the best but its quite good. The flavor was a wonderful blend of Parmesan, Pesto and Basil with soft pasta (slightly beyond Al Dente). A true tease to the tongue if I may put it loosely. Captain : So I take one slice of bread, put some pasta in and cover it with the other. A perfect pasta sandwich. Crewmate : That be a fine idea Cappy but that doesn't leave any bread for me. Crewmate : Are you even listening? Brownie with Ice Cream looked good on visuals but the taste was no different from the average Brownie elsewhere. Apart from Brownies, there was an eggless pastry and cheesecake on offer. I felt that they could do with a few more dessert options. The service was decent. I did feel that the server fumbled with descriptions and could have been more informed. The pricing seems to be tipped on both sides of the scale for me. For Salad Bar, I think its slightly on the upper side. For Walnut Cafe, I feel its just right for the mains. Some items feel cheaper than the prices that I am accustomed to in Mumbai and some feel higher. The Salad Bar & Walnut Cafe has a lot of highs. 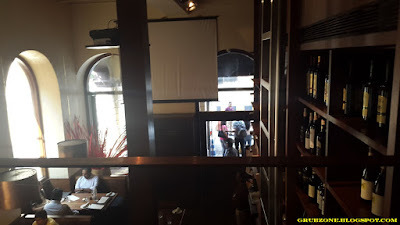 The highs include the health food, flavorsome mains and the pub like ambiance. The only low for me was the lack of choice in desserts on the day. Leaving this Vitamin periodic table picture here since I felt it was hilarious. "Oye fellas, all that health food should have powered your lazy arses up. We have dark clouds on the horizon. Put all yer sweat and power in. Lets steer through the storm." When people eat fine grub, they care the least about the way its cooked and the tools used to make it. But for me it was an interesting journey to know a bit about the instruments used in the craft. I must admit that I am a horrible cook myself, unable to make things beyond sandwiches and pre-made mixes/Do it yourself kits. 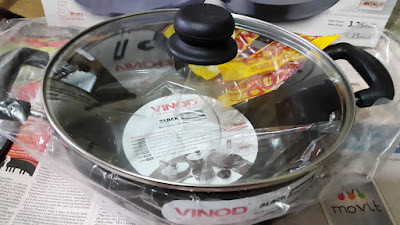 So when I received an invite from Food Bloggers Association of India and Vinod Cookware about an informative session on Vinod Cookware's products, I was naturally intrigued. Vinod Cookware had humble beginnings in 1963. And the current avatar was established in 1986. That definitely is not yesterday. It has survived from the times India had a socialist economy to present day which speaks a lot about the company's standing. 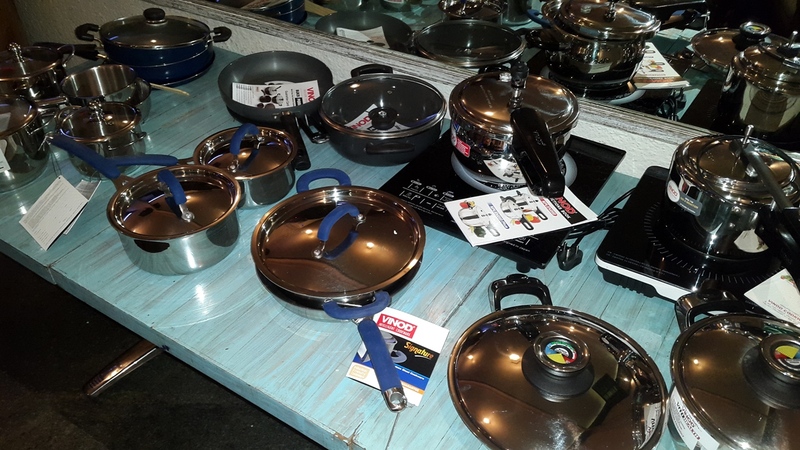 It has always been a market leader providing fine cookware to suit the needs of millions of households and restaurants. This meet began with a large number of food bloggers, Twitterati and the like. 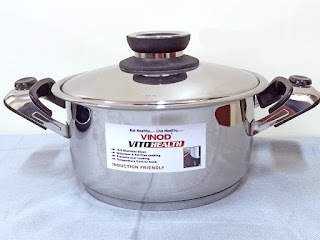 I know very little about Pressure cookers apart from the fact that I must turn the heat off after a few minutes or whistles(after applying the nozzle on the lid). 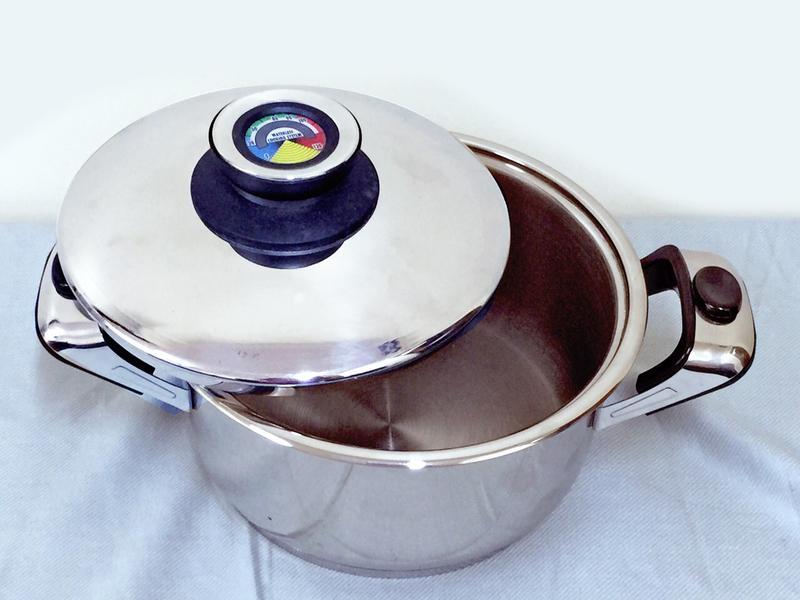 Pressure cookers are a staple for every Indian kitchen nowdays. Vinod's Cookers come with a sandwich bottom which is a first in India. This ensures uniform heat and that the food doesn't stick to the bottom. Its human friendly with a longer handle and better grip. 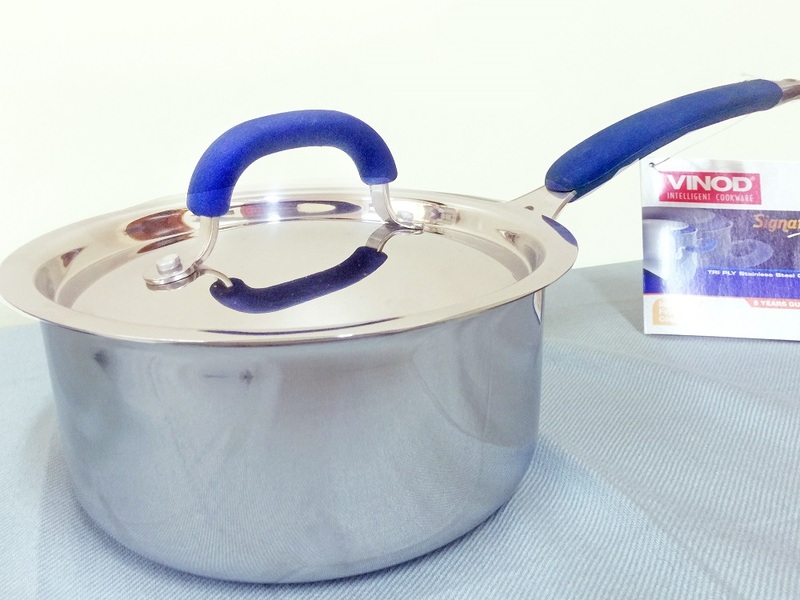 Its made of stainless steel and makes an excellent meal. The Tuscany range consists of frying pans, saucepans and casseroles. 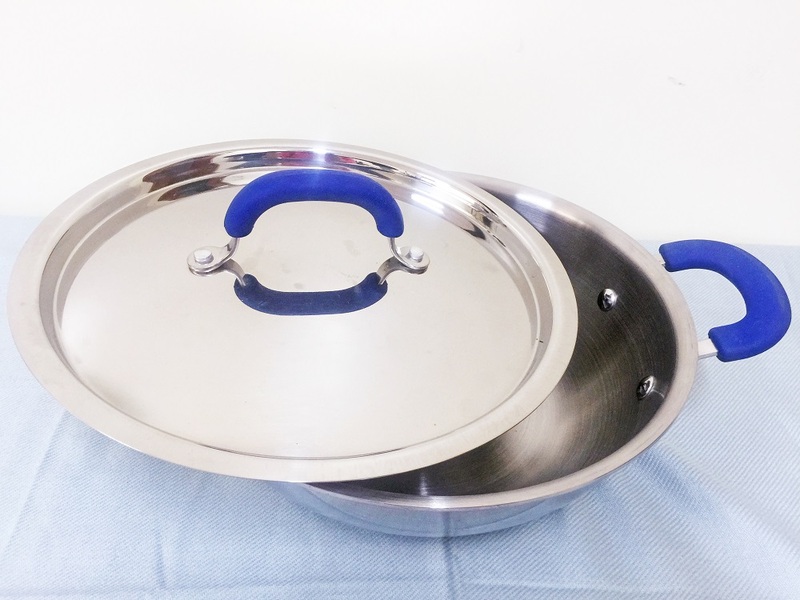 These are induction friendly and can be used to cook food as well as serve and store food. The elegant and shiny appearance works well for aesthetics too. These surely make a pretty part of any kitchen. The Black Pearl Range owes its name to its shiny Melanite like appearance. Frying pans, Deep pans, Kadais, Serve pots with Glass lids, etc are made using the hard anodized technology. Hard Anodized technology was initially made by Russian scientists for space technology and strengthening aluminum. 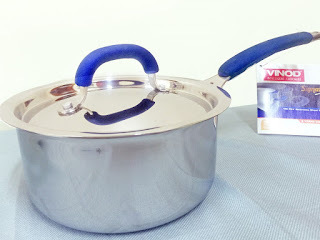 Now its used to make top of the line cookware that even a cooking beginner like me can use. The range in the pictures costs INR 2500 and even comes with a multi-year warranty. The Zest Inducto Plus set comes with a Concave Tawa, Deep Fry pan and Deep Kadai. The set has a large longevity and durability. 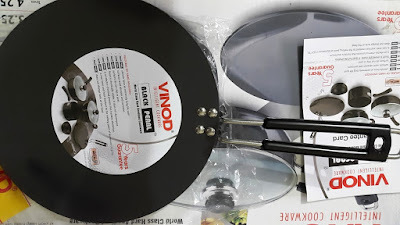 The set has a 3.0 mm thick Aluminum coating that ensures even cooking with no food sticking or burning at the surface. It also provides great mileage as it ensures efficient cooking and helps save gas and fuel. Its even easy to clean. This range costs about 1100 INR to 5745 INR with a year long guarantee. Fry Pan and the Health Skillet. 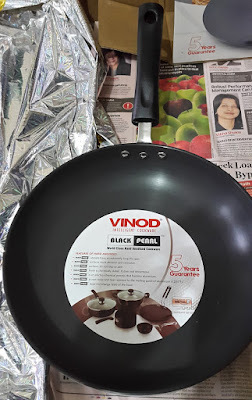 Finally, I heard a bit about the Vinod Signature plus range. This set consists of saucepans, saucepots and Kadais. It uses a multi-layered or a Tri-Ply structure to ensure world class cooking. The middle layer ensures even spread of heat and prevents sticking with lesser requirement of stirring. 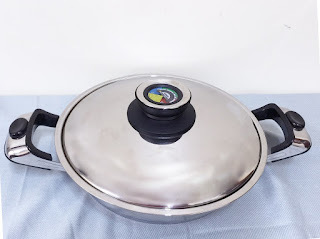 The outermost layer is made of a magnetic stainless steel alloy that supports induction cooking. 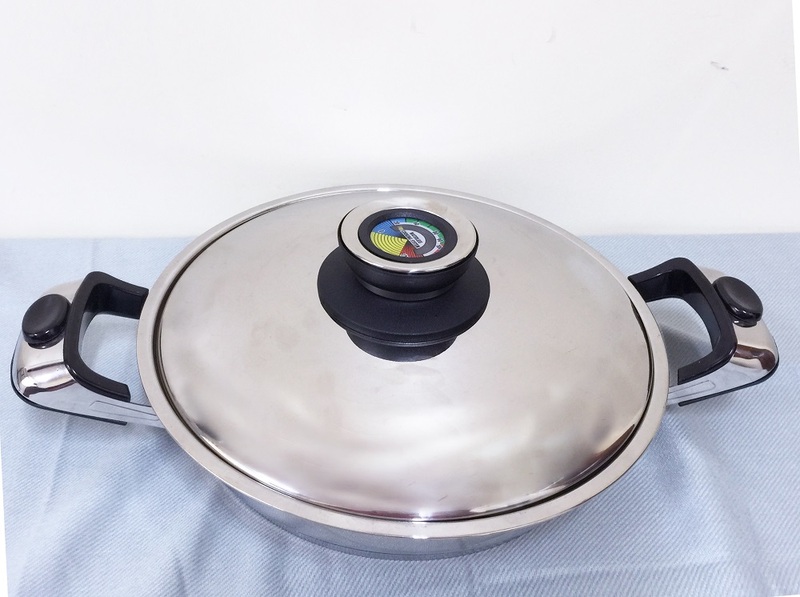 The innermost layer imparts durability and ensures hygienic cooking. Due to the design, these instruments reduce as much as 20% of the cooking time. That is really something. I learnt a lot of things in this small session. Not just from the product demonstrators but also from some fellow bloggers who had used these instruments and were far more knowledgeable than me in the matters of cooking. From amateur cooks(like yours truly) to renowned chefs. These top of the line tools are meant for everyone. These instruments are available at most supermarts, online stores and also at Vinods website. Captain : Lunch has been delayed today, where is the cook? Crewmate : He went to attend some product demonstration, Cappy. Captain : Barnacles. Looks like we will be heading to some restaurant on this island. Crewmate : How will we find a restaurant out of the blue? Tis' was a perfect sunny day and I was on me relaxing chair on the deck looking up at the clouds above the sea. The cries of the seagulls reminded me that despite no shores in sight, we were quite close to a coast. Without warning an innocuous piece paper flew in from nowhere and fell flat on my face. Startled, I sat upright and saw what the paper was. To me surprise, it was a restaurant flyer telling me about a new place and it invited the reader for a tasting. Not one to give up free grub, I immediately ordered the crew to set course for the nearest coast. Phoenix Market City is one of the biggest malls in India and Asia. So all trips made here feel a bit special to me. There is always something new to explore and in the past few months a lot of new restaurants have become operational over here. The place is so large that it should probably have its own pin/zip code. Amaya was quite easy to find as its close to the main entrance. 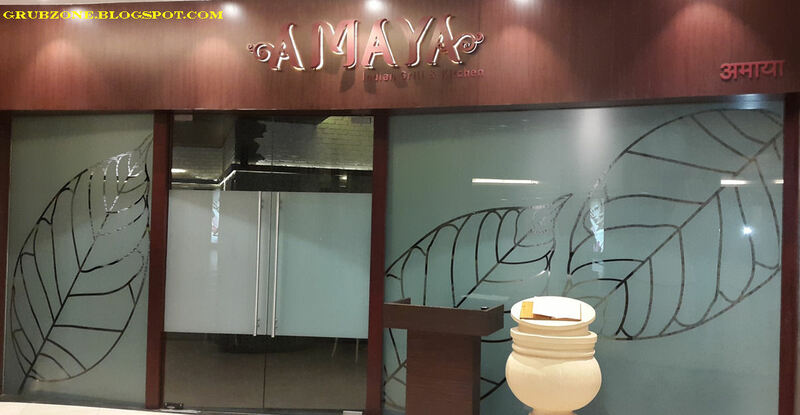 This serves as a strategic advantage as Amaya is one of the many restaurants in the mall. It would face a tough competition though. How will it fare? Only time shall tell. Amaya is a small restaurant with an area closer to that of a cafe. The place has a feeling of brand new all over it. It felt pristine and evoked a sense of romance. This feeling is best described as "this moment will never happen again so savor it while you can". The ambiance felt mixed. 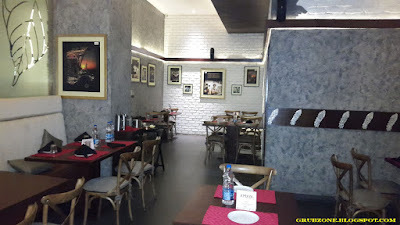 Despite being a North Indian eatery, the decor feels like a mix of a European cafe, a Victorian wall and some Rajput influences. The lighting felt just right. It illuminated the walls but was not in your face bright. Quite a comforting ambiance but it did not feel typical of a North Indian installation. 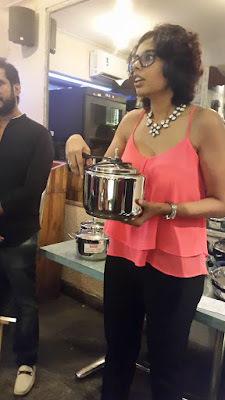 I was invited by Bellona Hospitality (is a subsidiary of the group that owns the Phoenix malls) along with some other Bloggers and Zomans as part of a tasting session. Our grub was part of a fixed taster's menu which included a large course of appetizers and a generous number of mains. 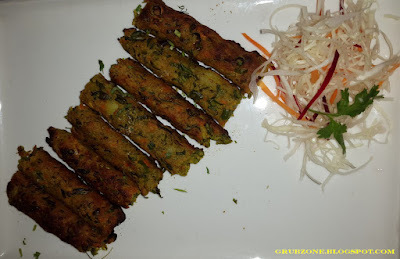 Punjabi Lasooni Kebabs were well textured, well marinated, yoghurt infused and flavorful kebabs. The garlicky core would often make these addicting to the taste buds. Each bite would bring out the flavor within. A classic well played. Hare Mirch aur Dhania Ki Tikki could use a smaller name as that would help people remember this tasty delight. This was the best appetizer amongst the ones served to me. The core taste was dominated by a Cheddar cheese base with balanced flavor from the coriander and spice. Despite their simple appearance, they pack a pleasant surprise within. Captain : These Tikkis could be mistaken for Gold coins if I go by the taste. Crewmate : Or Cheese Coins. Captain : Well put. Here is a coin for your efforts. Crewmate : Hey! Thats a worn copper coin from your pocket. Where is my Tikki? 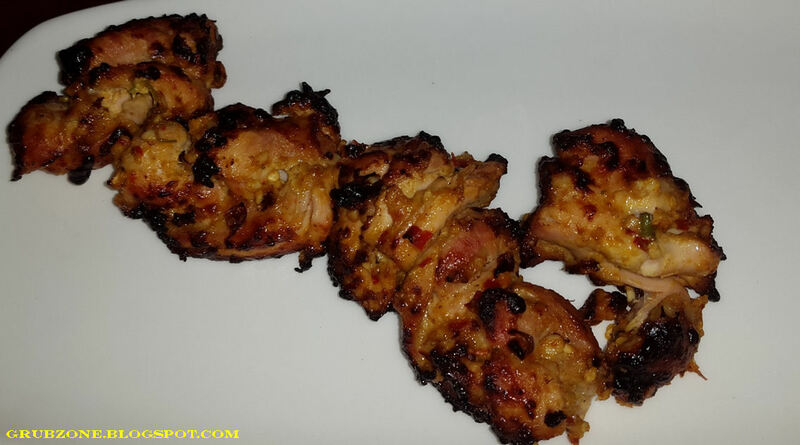 Pahadi Murgh Tikka had a strong mint(pudhina) flavor within. Even its aroma was infused with the mint. The meat however felt a little hard and there were quite many overdone areas as visible in the picture. The overall experience was still good but the blackened areas affected the aesthetic appeal of the item. 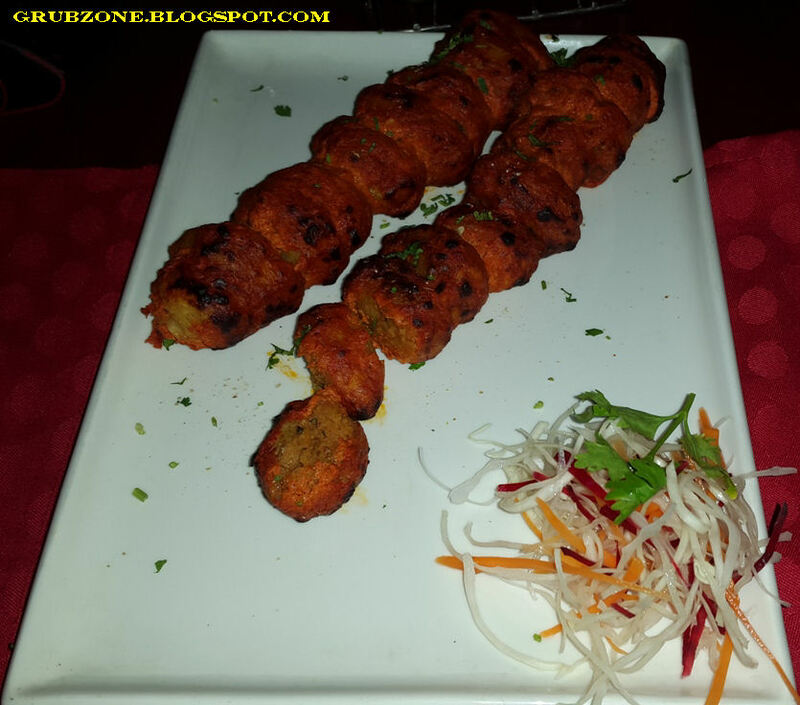 Lamb Gilafi Seekh Kebab was a little too tangy and tart for me. I suppose it originated from the cilantro added in its mix. While the item had a good appearance and texture, the flavor suffered a bit.This could however very well been a teething problem. Noorani Seekh Kebab is a vegetarian kebab with a tricky name. I initially assumed that it was a meat kebab till I actually saw it. However, that did not deter me from devouring it like a ravenous monster. The minced vegetables and seasoning complemented each other like Romeo and Juliet. Karare Macchi had a crunchy coating but the soft gooey Basa within proved to be anti climatic. I do feel that a different fish should have been used for this. Basa is too over used and feels like a misfit in some places and dishes. 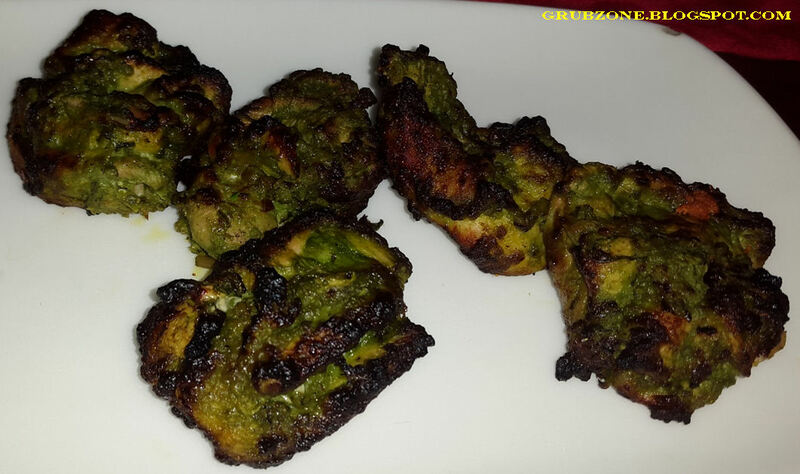 Bharwan Aloo was an aromatic and piquant preparation. Despite the humble appearance, each morsel was full of tasty potato and spices. The undertones of Tomato gave it a very Lucknow like feel. One slight issue however was that it was far too soft. It would literally melt in the mouth which shouldn't be the case for this preparation. Captain : I'd love my potato to be like this. Crewmate : It feels very soft for Bharwan Aloo. Captain : Is that bad? No worries lad, I shall have yours too then. Hara Bhara Kebab felt quite off to me. It felt too spinachy and less kebaby. This item is usually a safe choice for me at many restaurants but Amaya's version did not work well with me. The potato content felt too low as the flavor was completely dominated by the peas, spinach and cumin seeds. 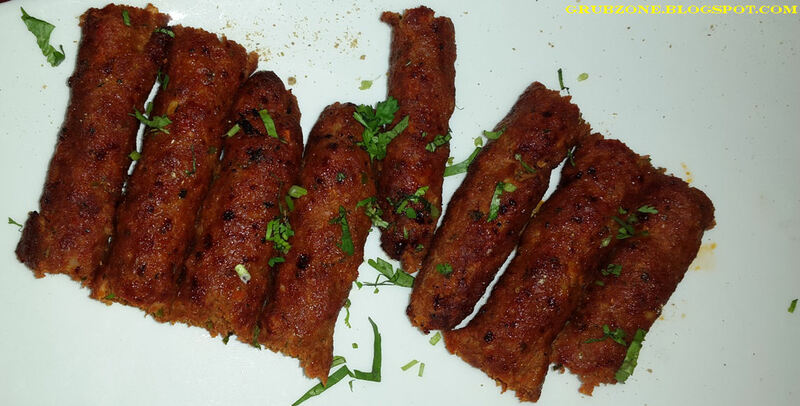 It also was far too soft as compared to all other Hara Bhara Kebabs that I have had. While the appetizers had their hits and misses, for me the highlight of the Amaya experience were their mains. The Gharana style cooking made the mains a pleasant experience rivaled only by the best of fine dines. 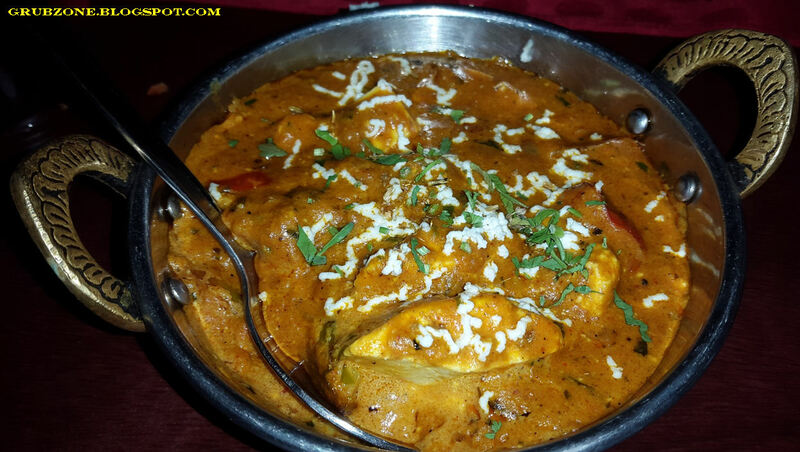 Kadhai Paneer had delectable chunks of Paneer tossed into a thick gravy made of creamy tomato sauce and cilantro. The flavor was balanced well and no ingredient dominated the flavor solely. 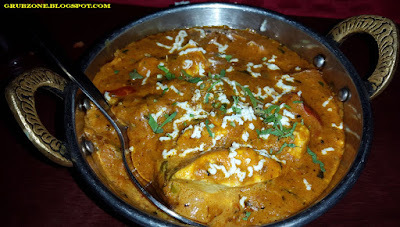 The creamy flavor felt comforting to the taste buds and the Paneer satiated the appetite created by the wonderful aroma. The pedigree of the Gharana style cooking made this variant several times superior to all other Kadai Paneer variants that I have had. 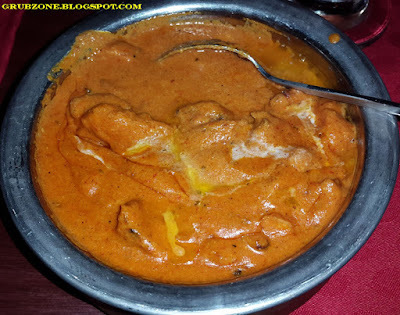 Murg Makhani or Butter chicken is one of my favorite dishes. It is one that I have had across many restaurants in India. And I must admit that this variant would easily be in my top three Butter chicken experiences. The gravy consistency was perfect. The Tomato flavoring was mild and appropriate. The creamy flavor could make a glutton out of the purest man. There was a slight sweetness that acted as the pivot to the flavor balance. The best part was that the chicken chunks were all well done. The chicken was cut into some kind of cuboid pieces rather than random shapes elsewhere. There were no bones, burnt edges or taste anomalies in any part of the dish. The flavor had sunk in quite well into the meat. I would come to Amaya again just for the Butter chicken. Its definitely the best that I have had in Mumbai. 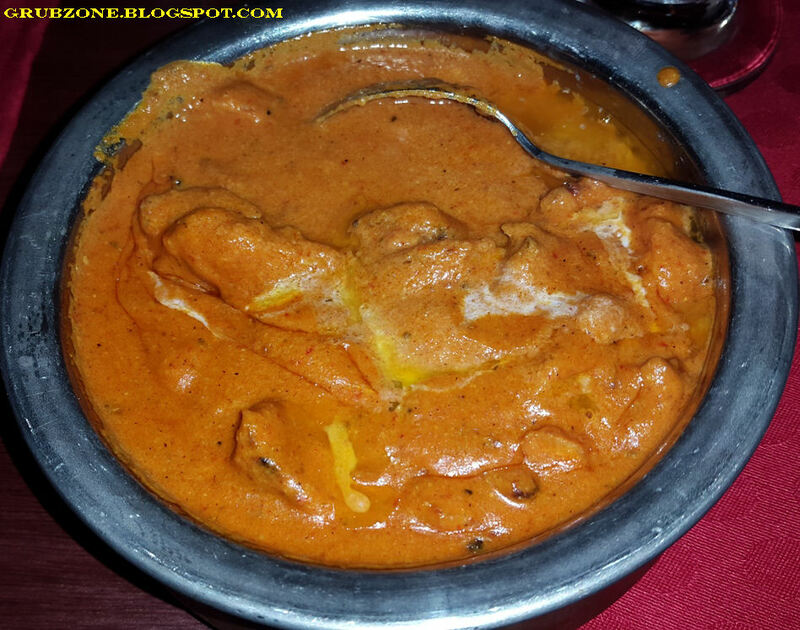 Captain : This is positively one of the best Butter Chicken dishes that I have ever had. Crewmate : This is the best Better Chicken that I have ever had. Captain : Better chicken? You mean Butter chicken. Is your tongue slipping on the cream? 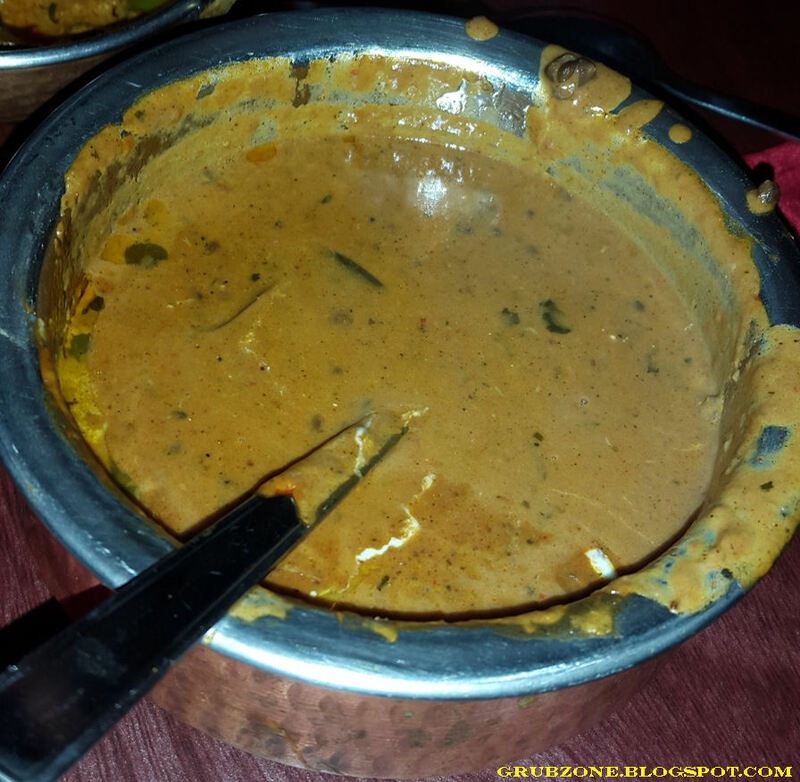 Dal Makhani had a tantalizing aroma but an atypical color. I am used to seeing darkened and almost brown color for Dal Makhani everywhere. The flavor was good with the butter enriching every morsel. But its consistency had a small problem. It was a little thinner than usual. Dal Makhani is supposed to be thick and dense. It went great with the Amaya Special Naans, then again everything went great with the Amaya specials. Amaya Special Butter Naan deserves a special mention here. It was among the tastiest breads that I ever had anywhere. It looked like a rainbow on a Naan. The appearance was colorful due to the different herbs present on it. All these spices and herbs enriched the flavor to something truly spectacular. It complimented Butter chicken and Dal Makhani very well. 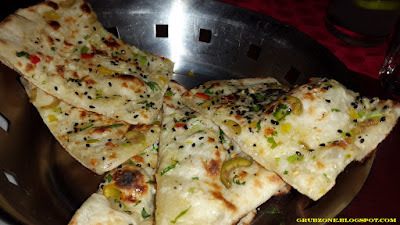 Regardless of what one orders as a main, this naan should form the bread part of the order. Captain: I would like to meet the chef who made this Naan. Crewmate : And compliment him? Captain : No, recruit him in me crew. Kache Murg Ki Bhuni Biryani looked peculiar to me. It was my first time with a Dum Purdah style Biryani. It is basically covering the Biryani with a roti like dough. The dough preserves a lot of aroma and warmth inside. The chicken chunks in the Biryani were quite juicy and tasty. The rice also was flavorsome and delicious. Yet there was a problem with this Biryani. The Chicken and Rice felt like two beautiful yet unhappy partners forced to be together. The flavors had not been married together. I supposed this too was a teething problem since everything else seemed perfect about this dish. 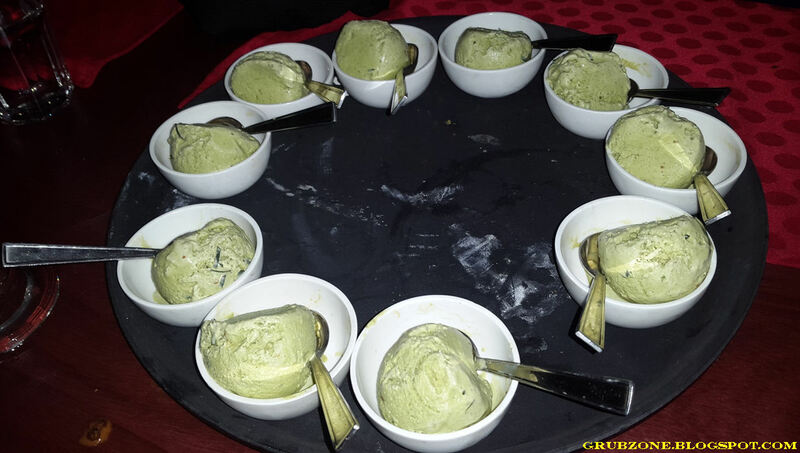 Paan Ice Cream provided a fitting end to a good Amaya story. This ice cream had a rich flavor of Paan(Betel nut leaves and Areca nut) which served as a palate cleanser, mouth freshener and a Dessert. All into one. The crushed Saunf (Fennel Seeds) also added to the above effects. I thought that it was quite odd for a North Indian place to serve ice cream as dessert but the Paan flavor made it shudh desi. Captain : This is the Indian peppermint. Crewmate(chuckles) : Or peppermint is the western Paan. Captain : Trying to be clever, are ya lad? The service was satisfactory. The servers were polite but they often lacked information on dishes. So a bit of polishing up on the service would be nice. The pricing is higher than the average casual dining place but lesser than places like Zaffran. For the quality that was served to us, I felt that the prices were well justified. To round this up, I shall just say one thing - If this place was close to my home, I would regularly come here for the Murgh Makhani and Amaya Special Naan. 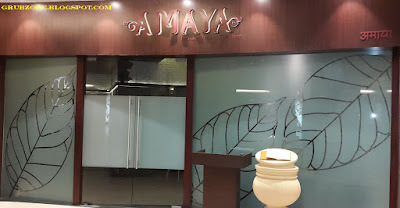 Amaya is a new restaurant which has got most of its notes in the right place. The food (especially the mains) is fantastic. And, I will add a special note here - the food was surprisingly light. 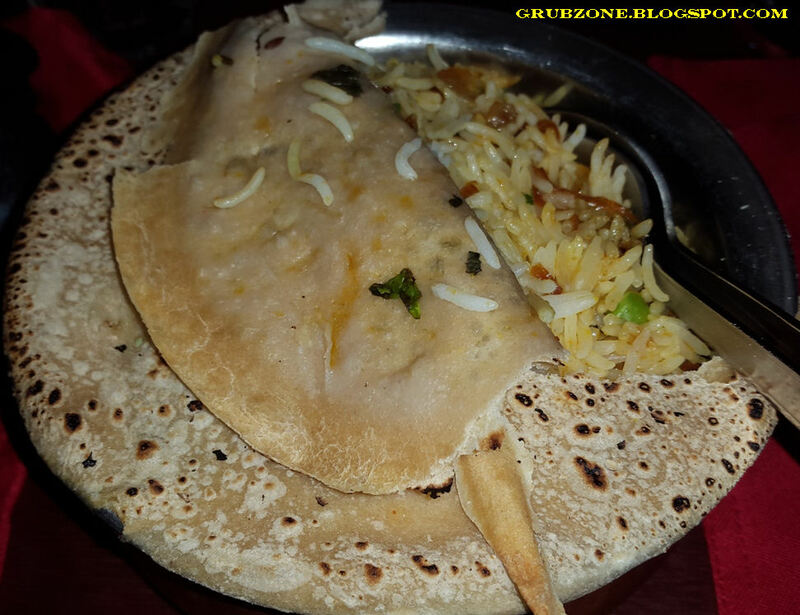 I often feel heavy after my North Indian food outings but I felt no such thing here. Some of the grub appeared oily but yet did not feel oily nor heavy. "It feels sad to depart lads but onward we must go. Its a long way back to the ship and a longer voyage out on the sea." We approached popular parts of the Arabian sea as me ship sailed towards the Gateway of India. My first mate reminded me that docking here would be very expensive and that our trip better be worth the effort. Seeing some of the most iconic grub houses on this island could be overwhelming. Me crew was at odds when we all chose different restaurants for the afternoon. So we decided to settle our choices in a mature manly way - through a game of rock, paper and scissors. Scissors I yelled, as me first mate and quartermaster held out a paper. Winner chooses the restaurant. Huzzah. Indigo Deli is one of the popular cafe chains across Mumbai and is well known to serve food for the gourmands. 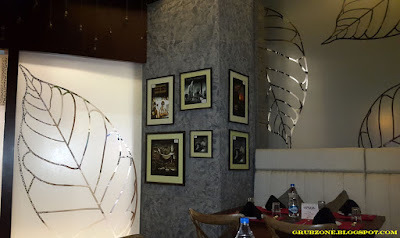 This was my first time in their Colaba outlet. Facing other giants like The Table, Pizza Express and Carter's Blue, Indigo was my choice after much deliberation. This outlet is located on a popular corner facing some of Mumbai's greatest attractions like the Taj Hotel and the Gateway of India. Its often frequented by celebs, expats, tourists and chat frenzy teenagers. The decor feels very vintage. Its probably the heritage exterior rubbing inside as well. The side with the windows appears very much like a colonial canteen while the large wine rack is reminiscent of a wine cellar with a ladder to boot. Though, I do assume that the ladder is rarely used. This place is more of a restaurant than a cafe due to its size. And it does some justice to the word 'delicatessen' by selling fine foods in a specialized area under the mezzanine floor. The wooden mezzanine floor leads to a smaller but comfortable area which overlooks the cafe below. I prefer my grub up here as I am a person who loves eating from high places. I had a built up a ravenous appetite so I needed to have my mains right away. 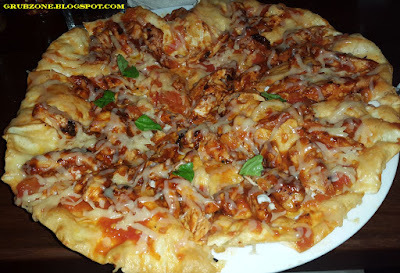 And thus, I ordered for one of my Deli favorites, the Barbecue chicken Pizza. The pizza tasted fine as the gourmet delicacy that it was. The sweet Barbecue sauce had made the chicken chunks really juicy with flavor. 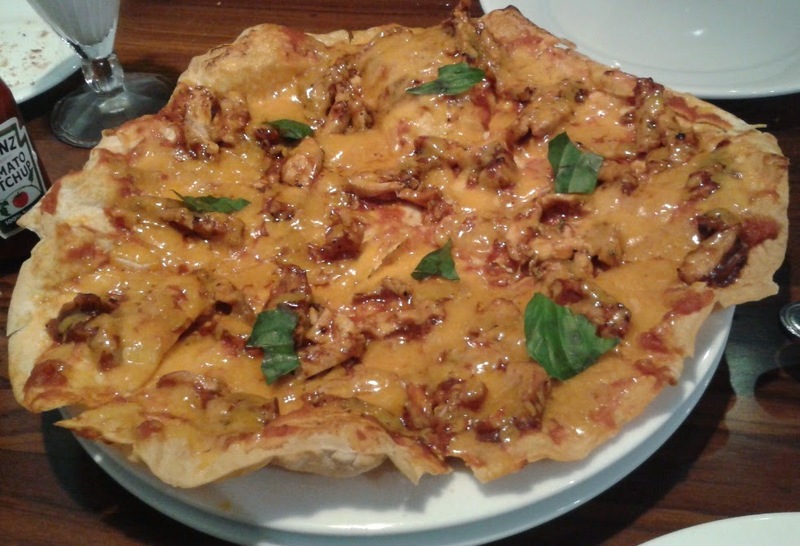 The wafer thin crust made it an ultra light pizza which doesn't make one feel heavy. However, there were two anomalies present as well. Since I have had this item too many times before, I was positive that something was wrong with the cheese content. It felt too less and too different. It used to be similar to Nacho cheese instead of the grated mozzarella like variant used here. Here is a link to how it appeared at my Indigo InOrbit experience. The second problem was that the chicken felt too less in comparison to the previous versions of the same item. This problem seems to apply to a lot of their burgers too. The portion sizes are distinctly smaller while the prices have largely been the same. A compromise on both quality and quantity is a dangerous road to tread upon. Captain : This Pizza feels very lacking. There is something missing. Captain : Oi, don't make it worse. First Mate : Well Captain, this was your choice after all. 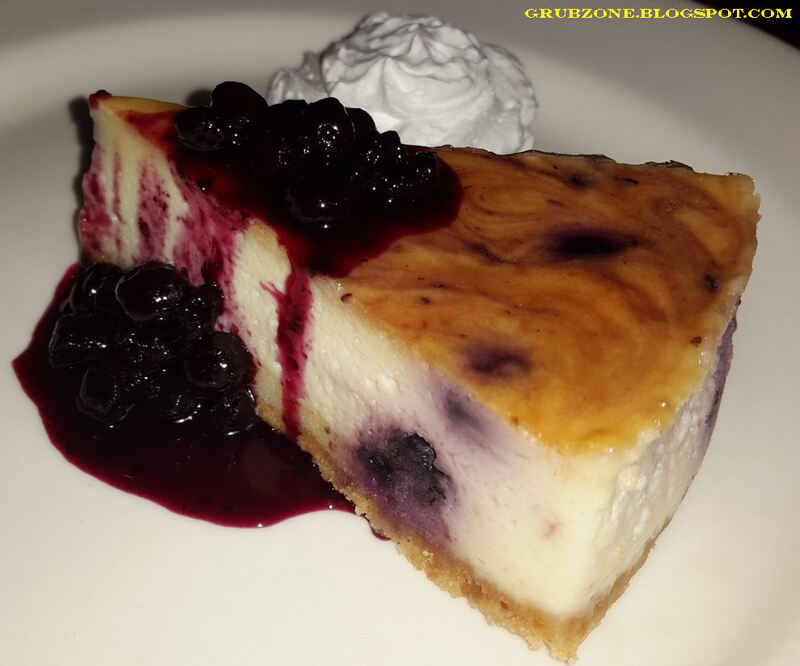 Baked Blueberry Cheesecake was a complete let down when it comes to Indigo's cheesecakes. This is the first time that I have been disappointed with Indigo's cheesecake in my many trips to their installations. I double checked before placing my order that this was indeed the egg containing baked variant. Sadly, the taste said otherwise. It tasted similar to the unbaked eggless variants that are often trumpeted as Cheesecakes by mass market bakeries. Adding to the pain was the fact that the "compote" tasted like medicine. Having a mass market bakery quality Cheesecake at Indigo's pricing isn't palatable at all. Captain : This is no Cheesecake. First Mate : Well mate, again it was your call. We should have gone with my choice. Captain : Stop rubbing it in, lads. The service was average for crowded conditions. While the servers were professional with their demeanor, a crowded cafe can often cause longer wait times. 'Often' however doesn't mean 'always'. A good service ensures that bottlenecks do not occur even in rush hours. And if I am to compare, I did feel that the service at their Malad outlet was far better than this outlet. The prices at Indigo are quite high. They are on par with many fine dining places and sometimes even beyond that. In the past, the experience and the grub always made up for the money spent. I am no penny pincher and I was a regular at their Malad outlet. But the recent quality of food has desecrated the value for money factor greatly. "I wonder how much our docking would cost us today. To the ship on the double lads. Until next time."